The Best CHM to PDF Converter on the Market! Here, at Developer Express Inc., we have numerous software products each supplied with the corresponding documentation file. We're trying to deliver documentation in different formats to better satisfy the demands of our customers: MS Help 2.0 (*.hxs) integrated into Visual Studio documentation, WinHelp (*.hlp) integrated into Borland/CodeGear Delphi, as well as *.chm for those who prefer to have stand-alone help files. Also, it is worth mentioning that, way back in the old days, we decided not to use any commercial help authoring tool, but instead to create an internal one to better synchronize the help contents with the structure of our classes. So, our internal tool automatically does all the routine trivial work, thus giving our technical writers the freedom to create masterpieces. Consider using one of the numerous third-party converters that are present on the market to convert help files from one of the available formats (*.chm, *.hlp, *.hxs) to PDF. Each choice had its pros and cons, and before making a final decision we started investigating how much time and money they cost. Our first overview of PDF converters, of which it seems there are vast numbers on the Internet, gave us the optimistic expectation that it would be an easy task to find a suitable one. Most of them promised to produce high-quality output, had multiple PDF-related options, and were sold at affordable prices. However, getting acquainted with most of them made us unhappy - even very simple help files were converted with a terrible number of shortcomings. Only one of those converters was able to produce PDF files with an acceptable level of quality, but after some time of using it, it turned out that it could do nothing with large help files (those that contain several thousand pages). We were very close to stopping our search for a third-party tool, when we got the idea to try just one more product. 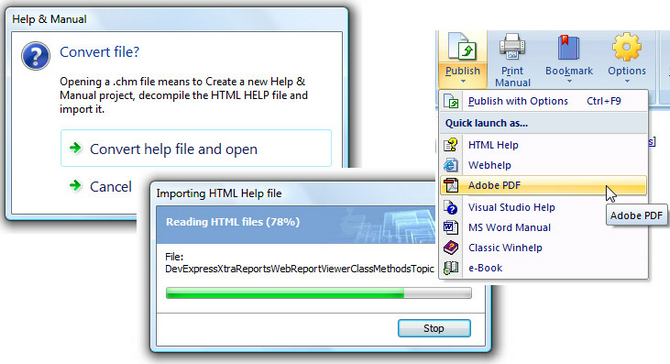 Not a simple converter this time, but instead one that had CHM import and PDF export in the list of features. It was Help+Manual. The test results were shocking! With just a few minutes processing, we got a 5,000 page PDF file. Of course, we still need to adjust some additional options to completely meet our requirements, but the general result was overwhelming, especially in comparison with the other competitors. All actions you should do are straightforward and clear: Open, Convert, Next, Yes, Ok, then Publish - and that's all. 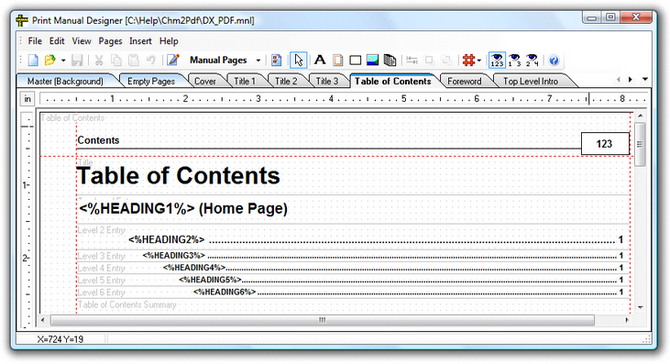 Another big surprise with Help+Manual was the complete control over the layout of the resulting PDF document. Help+Manual provides a built-in report designer, which allows you to define which sections should be present and modify their contents as you need. Moreover, you can define this template only once, save it to the disk and then use when exporting any other help projects to PDF. With the help of this designer, we soon got all the necessary PDF files with all required parameters, such as custom page size, page numbers and automatic table of contents. The decision was made pretty quickly - Help+Manual was our final choice. The User Interface of Help+Manual doesn't make you think too hard about what to do to achieve some task. All the elements are clear, easy-to-understand, and are nicely arranged in a ribbon, and this is a good indicator of the product's level of quality and usability. And last but not least - great high-quality support. Whenever you have any problem using Help+Manual, you can contact EC Software support and get a quick and - what is possibly more important - a very useful answer which always solves your problem. Thank you, Michael, Tim and Alexander for Help+Manual!